Hollywood seems to have a penchant for bringing out the worst in people, particularly those that we don’t usually associate with bad behaviour. BAD TEACHER, BAD GRANDPA and BAD SANTA are just three examples of recent “bad” movies, with filmmakers Jon Lucas and Scott Moore (the writers of THE HANGOVER) bringing their own brand of lewd behaviour into the mix with BAD MOMS. BAD MOMS tells the story of Amy Mitchell (Mila Kunis), a hardworking mother of two who spends her days trying to juggle career and family life. After separating from her cheating husband (David Walton) and fed up of being unable to keep up with the impossible standards of perfect parenthood, Amy finally works up the nerve to quit her life. She joins forces with two other over-stressed moms, Carla (Kathryn Hahn) and Kiki (Kristen Bell) and the three decide to go crazy with their newfound freedom. But when PTA president Gwendolyn (Christina Applegate) launches a crusade of judgment against them, the trio has to find a way to get even. 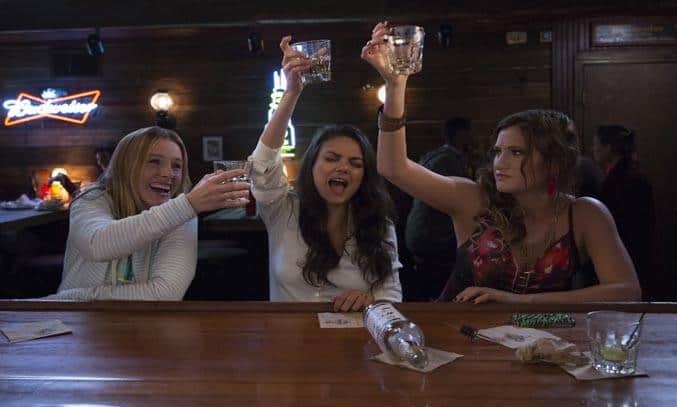 Feisty, fun but ultimately forgetful, BAD MOMS is exactly what you expect it to be – a raunchy comedy about three overworked and under-appreciated moms who ditch their conventional responsibilities for a jolt of long overdue freedom, fun, and self-indulgence. The film’s central joke focuses on what would happen if mothers stopped giving a care and for the most part, it succeeds fairly well. The vast majority of the scenarios are funny, particularly those that focus on everyday situations and the chemistry and quick banter between Kunis, Bell and Hahn works particularly well and pushes the story forward. While BAD MOMS boasts enough feisty fun to keep you entertained for 100 minutes, the film is by no means flawless. Not every joke is a winner and those that aren’t tend to rely on shock value and boast little in the way of comedy value. There are far too many musical montages with entire sections of the film devoted to watching Amy, Carla, and Kiki indulge in hedonistic behaviour (e.g. 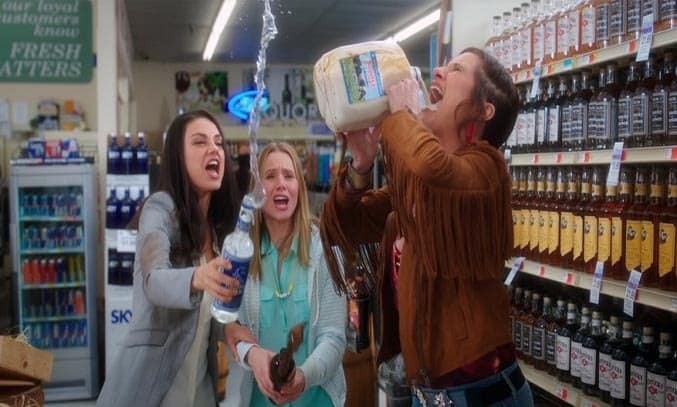 trashing a supermarket, throwing a booze party and attempting to get Amy laid) all of which are filmed in slow-motion. The tonal shift towards the end of the film also feels a little forced and the plot is wrapped up way too quick with astonishingly lazy tidiness. But what BAD MOMS lacks in storytelling prowess, it more than makes up for in the charisma and chemistry of its leads. Mila Kunis is convincing as a mom trying so hard to be perfect that when she does snap, her laid back attitude makes her likeable and relatable, even if her choices are at times questionable. Kristen Bell entertains as the dorky and modest stay-at-home mom who lives under the thumb of her controlling husband. But the real star is Kathryn Hahn as promiscuous and irresponsible Carla. Carla is required to say and do the most outrageous things imaginable and Hahn sells each raunchy line with such comedic conviction that what could have been a throwaway gag quickly turns into funny and memorable dialogue. The raunchy and rowdy nature of BAD MOMS won’t appeal to everyone but there is a core of goodness beneath all the naughty behaviour and a sincere message about how it’s okay for parents to make mistakes. The end credits in which the lead actors talk to their real life mothers about their upbringing and childhood is also a nice touch and worth staying the extra five minutes in the cinema for. If you like full-throttle raunchy comedies like BRIDEMAIDS and TRAINWRECK, you’ll probably enjoy BAD MOMS. If not, it might be worth giving this one a miss.